From bold, bright florals to sophisticated vintage glamour, we take a look at some of the biggest trends hitting barn weddings this spring and beyond. Barns often make ideal wedding venues, offering flexibility, beautiful countryside settings, buckets of rustic charm, and a blank canvas onto which you can project your own style and personality. If you’re planning a barn wedding this spring, take a look at some of the hottest new trends that will help your big day stand out from the crowd for all the right reasons. Colourful florals are big news this spring, and they look especially effective when framed against the neutral, rustic surroundings of a beautiful barn venue. Add splashes of colour with bold floral centrepieces that match your bouquet or go all-out with a romantic flower arch or wall that will look fantastic in your wedding photos. You can also extend the flower theme to your wedding party, with floral dresses or flower crowns for your maids, and floral-patterned bow ties for the groom and his ushers. Barns are synonymous with the countryside and nature, so it makes sense to embrace one of this season’s biggest wedding trends – bringing the outdoors inside. Decorate the space with lush, organic greenery and foliage, adding ornamental trees and whimsical, romantic flower arrangements for an up-to-the minute look that is fresh, stylish and elegant. Spring may be primarily associated with pretty pastel shades, but this year’s barn weddings are going bolder, with deep, rich colours that really make an impact. Purple is the most popular colour of the season, and on-trend couples are choosing shades across the whole spectrum, from vibrant violet tints to sophisticated indigo hues. Coral and yellow are also big news this season, and these bright, summery colours will help to add a splash of sunshine to your big day. Barn venues lend themselves perfectly to rustic-themed weddings, but if you’re looking for something a little more sophisticated, they also work really well with one of this season’s biggest trends – vintage glamour. Take inspiration from bygone eras with vintage props such as candelabras and crystal chandeliers, muted metallic shades, antique finishes, ornate accessories and elegant yet understated floral arrangements and centrepieces. Take the theme a step further by serving your guests traditional cocktails in vintage crystal glassware. The flexibility and relaxed nature of a barn wedding means that you can play around with the catering and perhaps move away from the traditional wedding breakfast set-up. Opt for one of this year’s biggest trends with sharing plates served on long banqueting tables. Alternatively, for a more informal option, provide a selection of grazing stations where guests can help themselves to cheese, meats, fruit, breads and antipasti, or even move things outside for a relaxed gourmet BBQ. There are some great barn wedding trends out there at the moment, so it’s just about choosing the ones that work best for you. 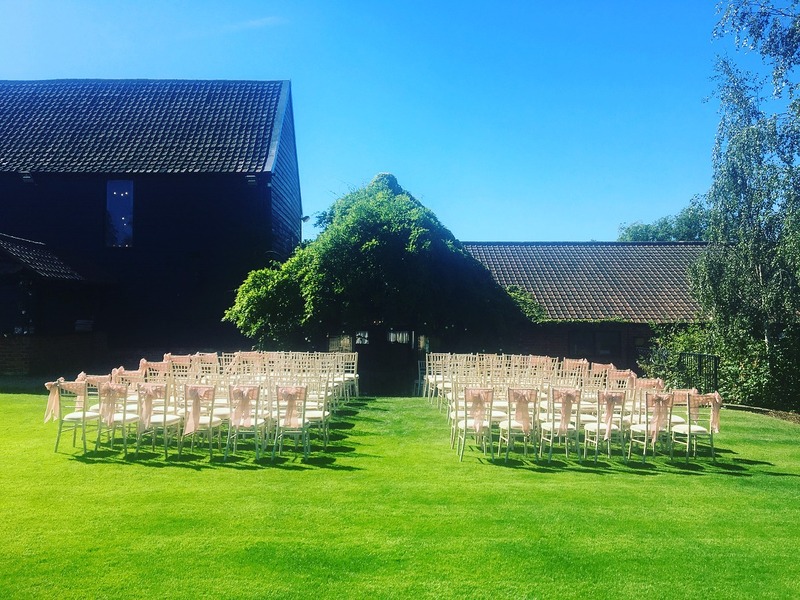 As one of the premier barn wedding venues in Essex, we are experienced in helping couples to achieve their vision, so call us today and start planning your dream wedding.